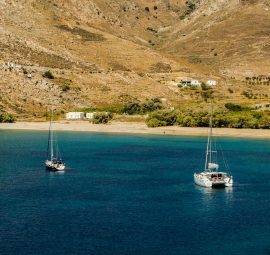 Legend has it that if you visit the island of Sifnos once, you will find yourself drifting back to it each time you sail the Aegean. 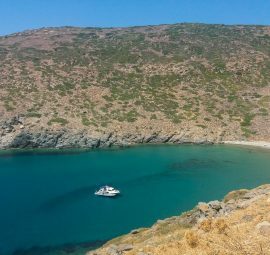 By many, it is considered to be the utmost authentic island in the Cyclades, since Sifnos will seduce you with its unique gastronomy and elegant essence. To truly appreciate the unique charm of the place and discover its hidden treasures you need to explore it with your own senses. Stroll through narrow paved alleys, smell fragrant herbs and flowers, taste famous local cuisine, gaze into the endless blue views of the Aegean Sea, listen to traditional sounds of flute and violin during the traditional celebrations, and let the warm sun and crystal clean waters touch your skin and soul. There is quietness that will help you relax, while the youthful atmosphere will put you on a holiday mood. 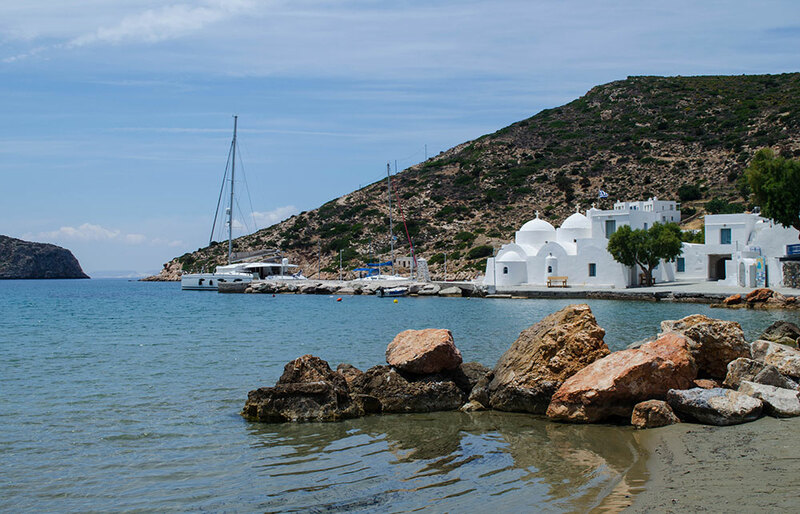 If you want a quintessential Cycladic experience of picturesque landscapes and great atmosphere, then you will find everything you are looking for in Sifnos, which is why many visitors also choose it for their ideal wedding destination. Ancient Acropolis of Agios Andreas: is the first open air archeological site of Sifnos and probably the most significant site on the island. It is situated on the top of the Agios Andreas hill on the way to Vathi from Apollonia. The ancient town unearthed here was Mycenaean, built sometime in the 13th century. It extends over an area of 10.000 meters and includes an urban network of buildings, temple, roads, rainwater management and various smaller movable objects. Its impressive size denotes the former prosperity of the island. 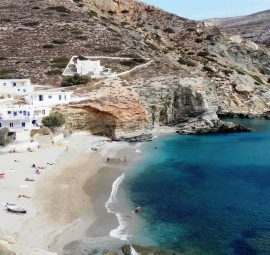 Kastro: is one of the most stunning attractions of Sifnos, being a medieval village build on top of a rock with steep cliffs on its side and panoramic views over the sea and the neighboring islands. Kastro was the capital of the island until 1836 and played a very important role in the history of Sífnos. 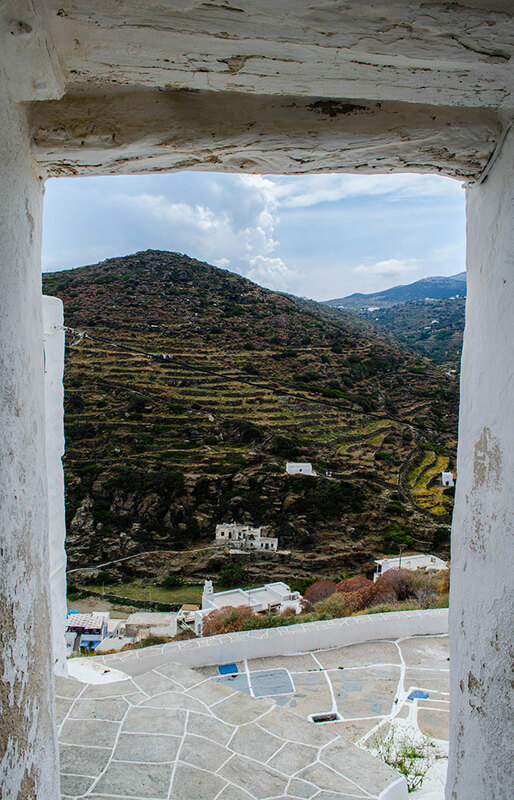 Although inhabited since prehistoric times, Kastro was rebuilt in 1630 during the Venetian colonization and has kept all the characteristics of a fortified village, making it the only village in Sifnos with a strong medieval character. 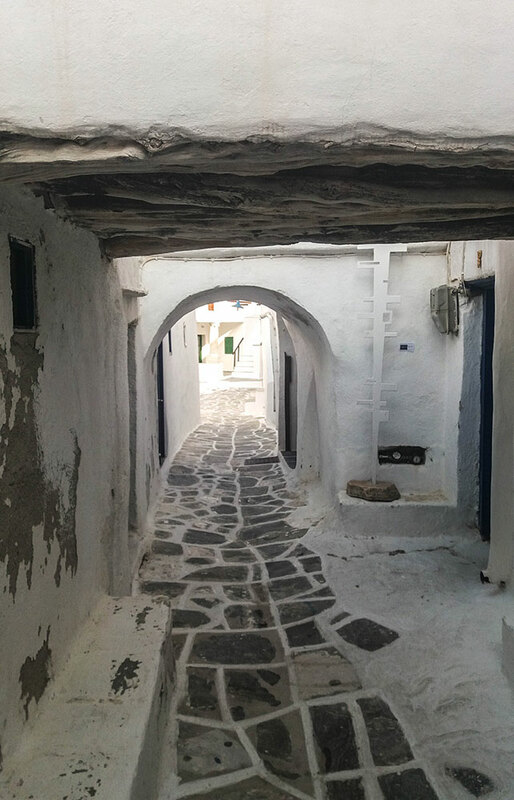 A picturesque walk through its narrow alleys is an absolute must while in Sifnos, as the entire village looks like an open-air museum. At the bottom of Kastro hill one can find a small pebble beach of Gialos or “Seralia”, the ancient port of the island, which got its name from the Turkish word saray (=palace), because of the palaces that once existed in this area. Seven Martyrs Church: is the most photographed church on the island. This small chapel with traditional Cycladic style is situated in Kastro village and sits on top of a rocky islet that emerges from the sea. 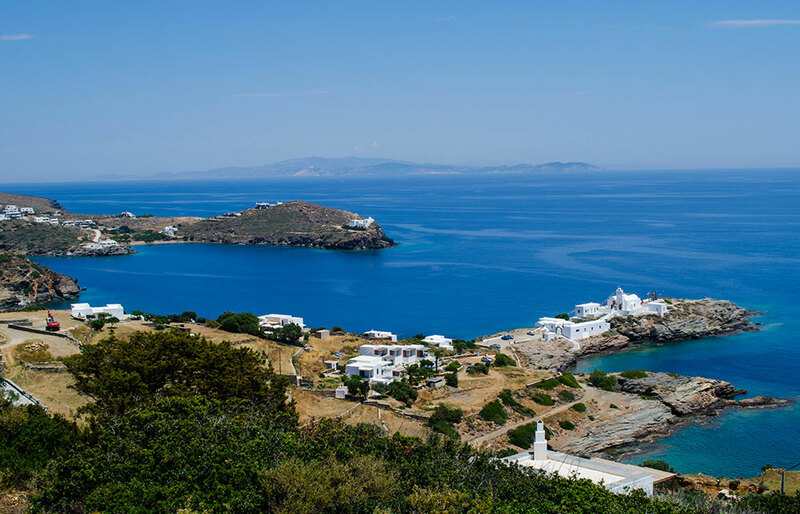 The small peninsula where the church is located is connected with the rest of the island with a set of long stairs, which happens to be one of the favourite locations for weddings on Sifnos. Church of Agios Symeon: rises high above Kamares offering a panoramic view of Kamares bay as well as breathtaking sunset views. Ancient Towers: are 55 and scattered all over the island. They were built between the 6th and 3rd century B.C. to pass on messages between the Ancient Acropolis in case of an invasion. Most of them are ruined, although Aspros Pyrgos, Black Tower and Katavati Tower are few that are still in good condition. Monastery of Chryssopigi: is the most visited monument on the island, as much for the beauty of the site as for the peaceful atmosphere. Panagia Chryssopigi the protectress of the island and unique symbol of Sífnos. It was built in 1650 on a top of a rock surrounded by the sea. According to tradition, nuns used to live in the monastery. In a pirate invasion, all of them ran to hide, but one didn’t manage to hide on time. She prayed on Virgin Mary to save her, and this is when the rock of the monastery was then cut in two, dropping the pirates into the sea. The monastery hosts a holy icon of Panagia which was found floating into the sea that is said to have miracle–working powers. Artemonas: is a beautiful Cycladic village embellished with unique neoclassical and Venetian mansions, giving it an authentic character. 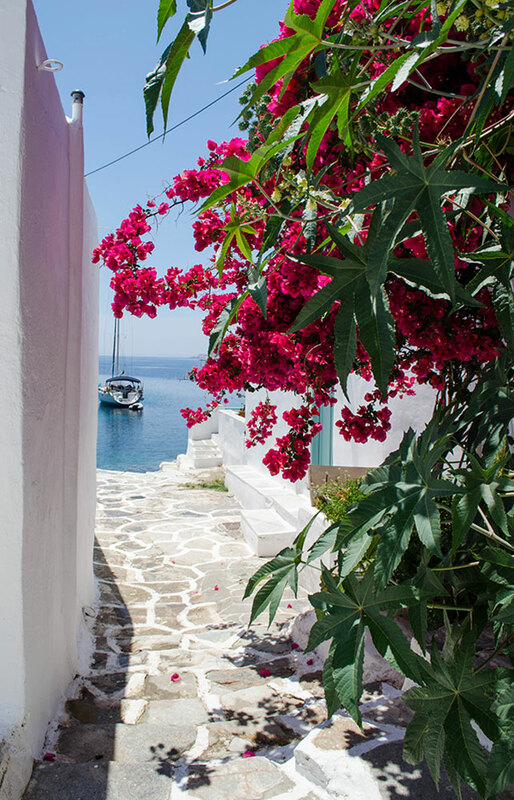 A walk around its elegant alleys will also give you a chance to enjoy stunning views of the Aegean Sea and the surrounding villages. Pottery workshops: can be found all around the island. Sifnos has a great tradition in pottery since ancient times. The first samples of pottery dates back to the Protocycladic period. The abundance of clay in Sifnos has made pottery a popular art and one of the best-known products of the island. In fact, the people of Sifnos have spread the art of pottery all over Greece. In the workshops visitors can find from unique cooking utensils to decorative art objects. Culinary expertise: is an essential part of Sifnos culture. Sifnos is the birthplace of one of the most famous Greek chefs of all times, Nikolaos Tselementes. Merely every household in Greece owns his legendary cooking book. It comes as no surprise, that the island has a rich tradition in fine cooking. 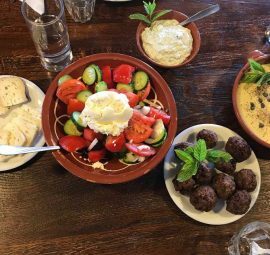 Most of the dishes are cooked slowly in clay pots, to make creamy and subtly smoked flavors that will impress every taste. 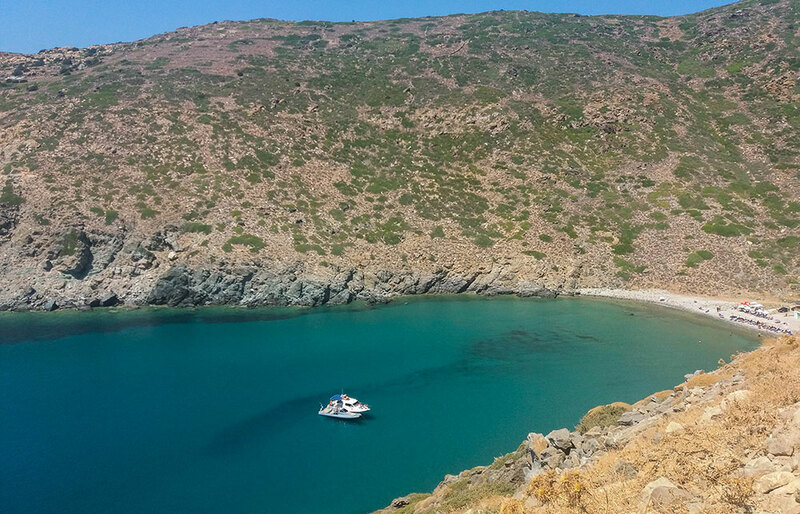 Hiking: is one of the best ways to explore Sifnos. 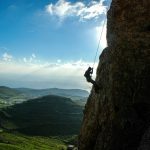 The island offers more than 100km of well marked trails for those who wish to explore the unique flora and fauna that finds shelter in its Natura 2000 areas, enjoy dramatic landscapes, watch the endless blue view of the Aegean Sea and discover beautiful secret corners. 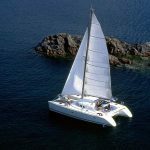 Among the best routes are the routes to Mavro Chorio, to Fikiada from Platy Yialos, from Kastro to Faros and from Kastro to Panagia Poulati. Apollonia is the capital of Sifnos, and is located in the heart of the island. It took its name from God Apollo who was worshiped by the inhabitants of the island in antiquity. A downhill walk along its stone paved pedestrian alleys leads you through this architecturally well preserved town. The settlements of this village spread out like an amphitheatre on the slopes of three hills and are carved into terraces planted with olive trees. Labyrinths of stepped lanes, each one paved, strange chimney pots decorated with birds, chapels here and there, traditional shops, flowered courtyards - characteristics that make the place ideal for those who want to steep themselves in the atmosphere of Sifnos and discover its subtle art of living. Those interested in the history of Sifnos can visit the Folklore Museum on the central square of Apollonia that displays items from the traditional life of the island. At night Apollonia’s main street, commonly known as “To steno”, fills with young people and life, as this is where you can find vivid bars and charming restaurants. Don’t forget to try local loukoumades at Treis Xanthoi Aggeloi (3 Blonde Angels), or have a drink/cocktail at one of the bars with outdoor verandas. Their view to the paved streets and the moonlight over the inland Apollonia is very rewarding! Kastro is a remarkable historic village built on the summit of a small peninsular and surrounded with the views of the Aegean sea, located 3km east of Apollonia. Until the 19th century Kastro was the capital of Sifnos and its significance as a defensive town, designed to protect its inhabitants from marauding pirates, is visible today in the uniquely fascinating architecture with strong medieval character. Narrow streets, old entrances, superb houses and mansions, churches with ornamental floors compose the stunning beauty of Kastro. Remains of the Ancient Acropolis of Kastro can also be seen on the top of the hill, while the Archaeological Museum of Sifnos in Kastro exhibits significant findings from the Ancient times of the island, including sculptures, statues, architectural parts and marble items. Artemonas is a uniquely picturesque traditional village which seems to be undisturbed by modern life. In the village’s old aristocratic neighborhood you can admire neoclassic mansions built 200 years ago. The whitewashed houses with their imposing character are a truly enchanting experience for all the visitors. 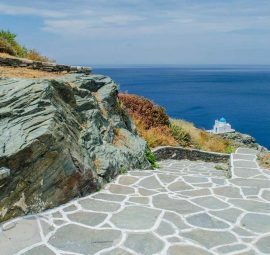 From Artemonas the path continues along the stone paved pedestrian alleys of Pano Petali, offering breathtaking views of the Aegean sea and the surrounding scenery, until it reaches the center of the island or the capital of Apollonia, just 1km walking distance away. Artemonas also is the bus terminal which makes it a convenient and central location that enables easy access to other sides of the island. 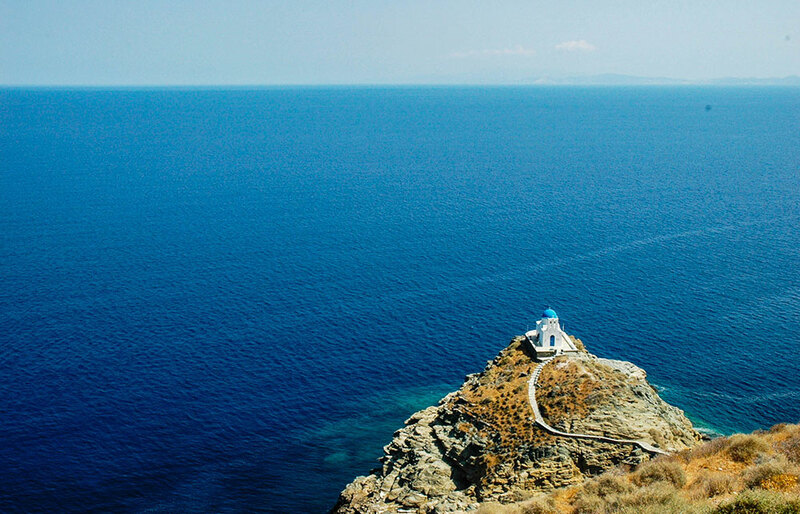 Just outside Artemonas there is the charming chapel of Panagia Poulati (1870) offering amazing views to the Aegean Sea and natural, secluded, rocky swimming spot surrounded by water springs, greenery and crystal clear water. 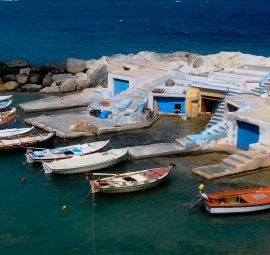 Cheronissos village is a fisherman’s paradise, on the north side of the island. This charming fishing village preserves a traditional character and maintains a unique simplicity. On its calm protected waters you will only find a few fishing boats and a couple fishing taverns. 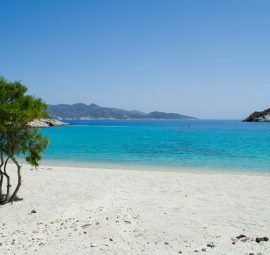 In fact Cheronissos is so calm that is preferred among many locals as a place of summer residence. 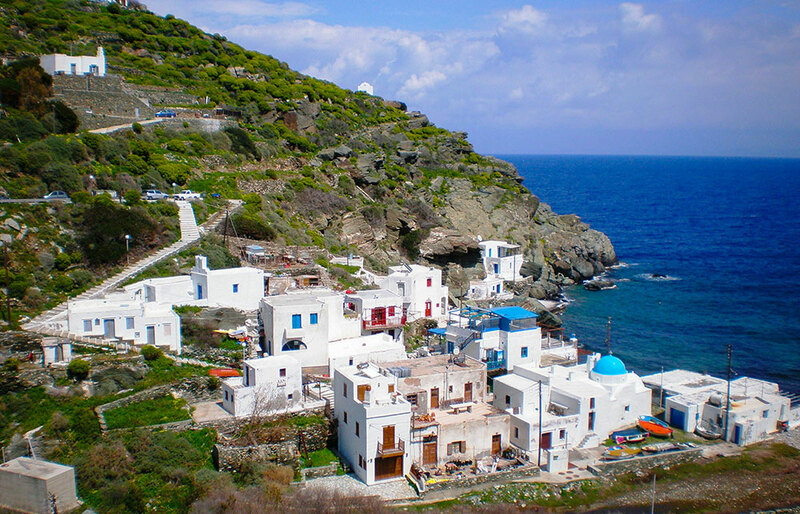 Faros is a fishing village located on the east side of the island. The village was named after the lighthouse (=faros in Greek) that stands at the port. This small settlement of whitewashed houses is ideal to those looking for tranquility. 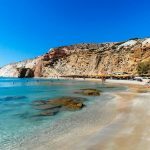 Its quiet, secluded coves (Fasolou, Glyfo and Faros beach) are popular among families with small children. 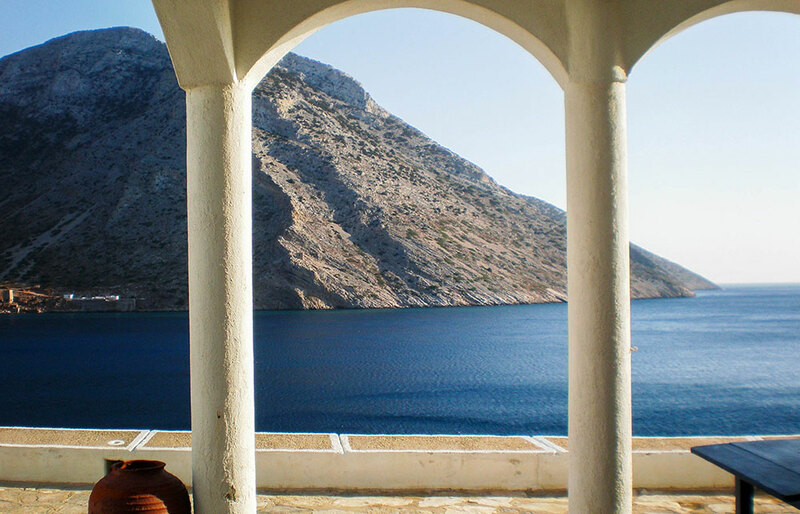 Overlooking the bay of Fasolou lies the monastery of Stavros, offering panoramic views to the sea and the Monastery of Chryssopigi. Kamares: lies next to the port of Sifnos, on the west side of the island, and is probably one of the best beaches on Sifnos. 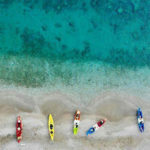 Kamares is a long, organized sandy beach with emerald shallow waters, awarded by the Blue Flag and is ideal for families and those looking for relaxation in its soft sand and lovely surrounding. 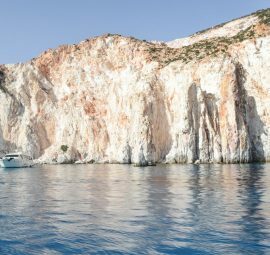 Due to its proximity to the port, Kamares offer all sort of amenities including tavernas, local shops, jewelry, accommodations or colorful pottery boutiques, and it also has frequent bus connections to the island main town (Apollonia). 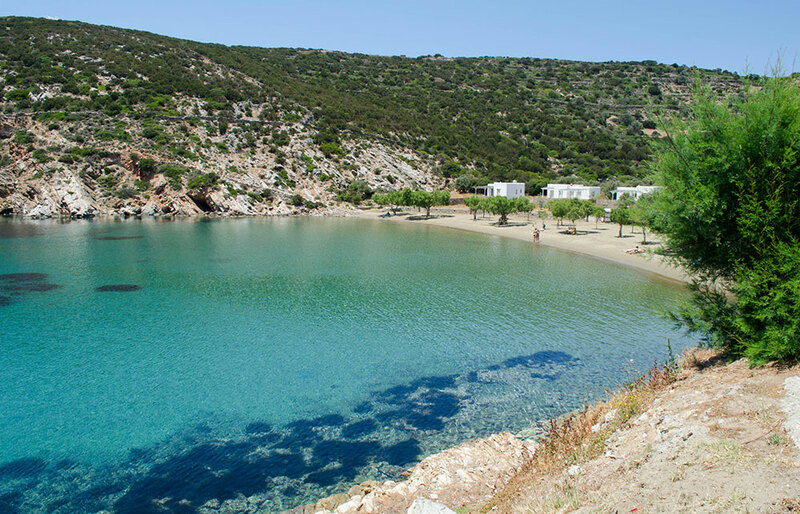 Platy Yialos: offers the perfect anchorage and setting for some time spent on the island’s longest sandy beach. Platy Yialos is one of the most popular beaches in Sifnos and is very well organized with various amenities including sunbeds, umbrellas, water sports, accommodations, bar and all sort of restaurants (traditional Greek, gourmet fish, Italian restaurant, cocktail bars etc). Right after Platy Yialos beach and behind a small hill, one can find Lazarou, an organized wooden sundeck which is a great swimming spot that harmoniously blends in the natural setting, ideal for relaxing day by the sea along with delicious lunch or cocktails. 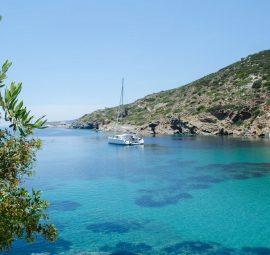 Vathi: is probably the best quiet sandy beach in Sifnos. This golden beach is beautifully set against the surrounding hills covered in olive trees, offering a nice green environment to relax. 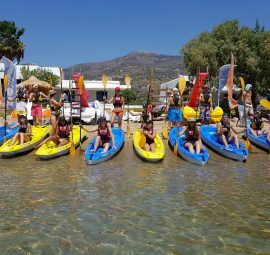 Along the beach you will find several tavernas, pottery shops, few seafront accommodation and the only 5 star resort of the island, the Elies Resorts, perfect for an upscale lunch sampling the local Sífnos cuisine and seafood. In front of the small port you will also find the charming little church of Taxiarchis. 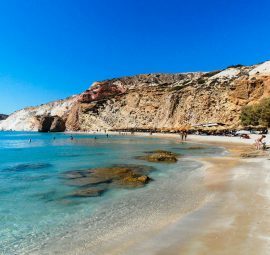 Vroulidia: is a small beach with sand and pebbles on the north side of the island. Right next to its shallow turquoise one will find various amenities including sun beds, umbrellas and a couple of tavernas. Chryssopigi: is a small cape that took its name from charming Monastery built right on top of it. 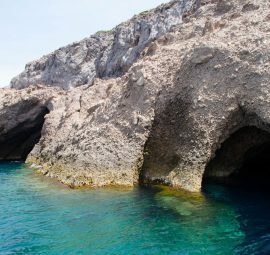 The rocks of Chysopigi are very popular among swimmers. On the east side of the Monastery you will find the relaxing beach of Apokofto, with golden sand and crystal waters, surrounded by many tamarisks trees that provide excellent shade. Right on the beach of Apokofto there are a couple of highly recommended taverns on the island. On the west side of the Monastery there is the small isolated pebble beach of Saoures. Cheronissos: is situated on the northern part of Sifnos. It is a small fishing village, known for its unspoiled natural beauty. Its small sandy bay is ideal for those looking for tranquility and relaxation away from the crowds. Right on the beach you will also find some very nice tavernas that are known for excellent fresh fish. Seralia: is situated under the foot of the hill of Kastro. This small pebble beach used to be the ancient port of the island. Its name derives from the Turkish word saray (=palace), because of the palaces that once existed in this area. The beach is small but ideal for those that wish to be away from the crowds. 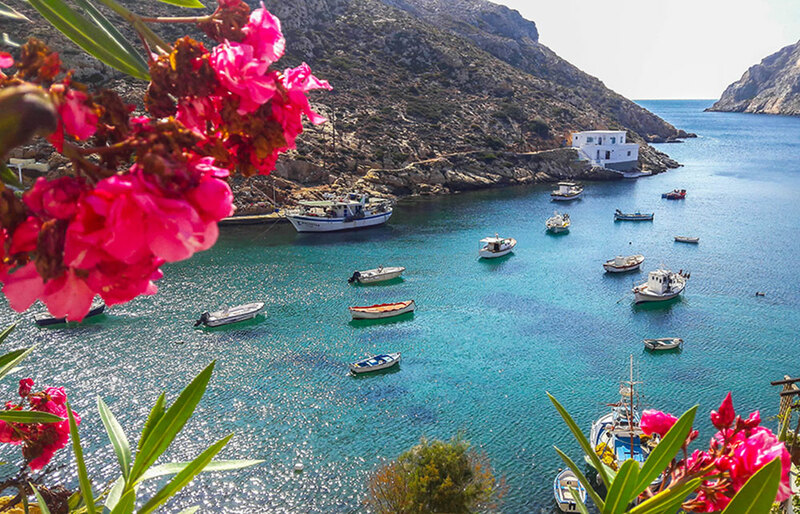 According to mythology, Sifnos was the island of God Apollo, the God of many things, including music, poetry, art, medicine, sun and light, who blessed the island with many natural beauties. The inhabitants expressed their gratitude to the God by offering to him a golden egg ever year. When the production of gold became scarce they offered him a gold plated rock. Apollo got furious and removed all resources and precious metal from the island; hence “sifnos” (=empty in Greek). 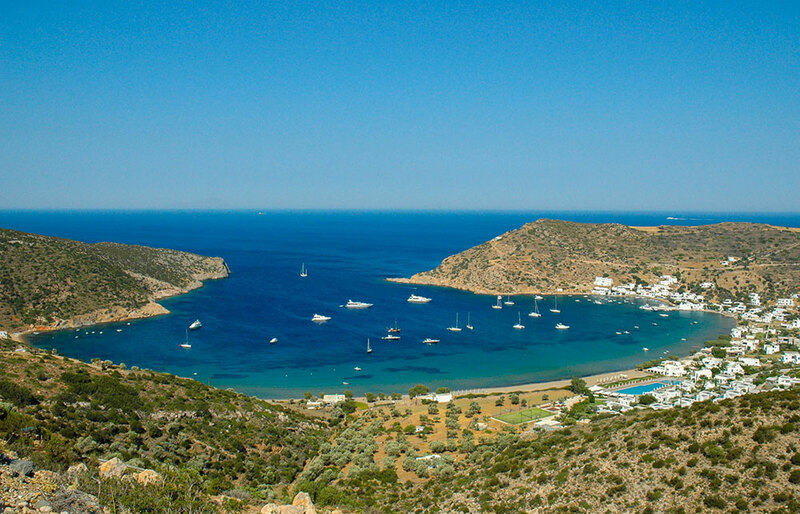 Another popular legend wants Sifnos to have been named after the Greek hero Sifnos, son of the Attic hero Sounios, who was the first inhabitant of the island. Ancient Times: Sifnos was first inhabited by Pelasgians and then by Phoenicians, Kares and Leleges, during the Neolithic times. Excavations have brought to light traces of inhabitance in small settlements in Kastro and the remnants of the imposing Acropolis at the site of Agios Andreas. During the Late Bronze Area the island came under the rule of the Minoans of Crete until the explosion of Santorini, which destroyed their main centers of civilization. After the explosion the Mycenaean civilization becomes the new power in Sifnos and the surrounding areas. Important Mycenaean findings have been discovered in the island. Around 1130 B.C. 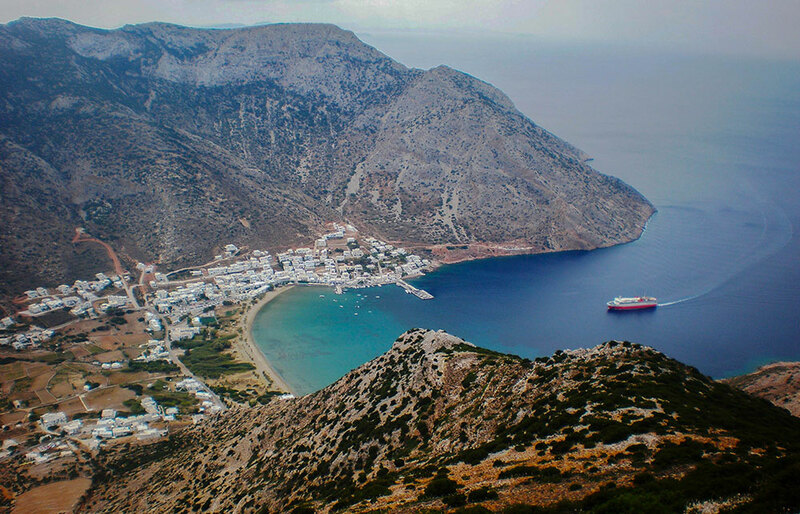 the Ionians arrived in Sifnos and it is believed that they founded the city of Kastro. During the 6th century the island develops significant gold and silver mining activity and flourishes. 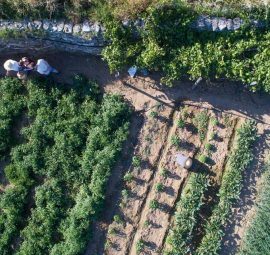 Evidences of this activity have been found at the locations of Agios Sostis, Agios Silvestros and Xero Xilo. However, when resources run out the economy declined. Roman and Byzantine Times: From 146-324 B.C. Sifnos was under Roman rule. In 1207, the island fell under the rule of Marko Sanudo, duke of Naxos, as the rest of the Cyclades. In 1297, it returns to the Byzantine rule. Ottoman Times: In 1537 Sifnos comes under the Ottoman rule until 1821. The island enjoyed favorable conditions under the rules of the Sultans and saw great economic and spiritual development. During that period the island the monasteries of Panayia Vrysiani (1642) and Panagia Cryshopigi (1650) are constructed. In 1646 the See of Sifnomilos is founded and Sifnos holds the archdiocese of over eleven islands. Education reaches its peak when in 1687 the School of the Holy Sepulchre (aka “The School of the Archipelagos”) was founded. The school prepared Sifnians to excel in the hierarchy of the church. Recent Years: Sifnos joined the Greek revolution of 1821, led by Nikolaos Chrysogelos. After the revolution, the island came under the Italian rule (1941-1944). During the 19th and 20th century, Sifnos excelled in many areas. In the area of knowledge there were many great scientists, writers and scholars, while in politics many Sifnians became members of the Greek Parliament. Sifnos is the birthplace of one of the most famous Greek chefs of all times, Nikolaos Tselementes. Merely every household in Greece owns his legendary cooking book. It comes as no surprise, that the island has a rich tradition in fine cooking. Most of the dishes are cooked slowly in clay pots, to make creamy and subtly smoked flavors that will satisfy even the most demanding visitor. Panagia Chryssopigi: is the one of the most significant celebrations in Sifnos, held in the Monastery of Panagia Chryssopigi 50 days after the Easter Sunday. Throughout the year a certain family called the "panigirades” (those in charge of the festival) keep the holy icon at their home. It is a big honor to be appointed “panigiras”. On the day of the feast the icon is returned to the Monastery and welcomed by the local community. A big feast follows which lasts until the early morning hours. Panigirades are also honored to undertake the organization and all the costs of the feast, which serves traditional chickpea soup, mastelo meat with spaghetti and wine for everyone. This feast is a must in one’s lifetime and it should not be missed! Prophet Elias panigiri: is celebrated in the evening of July 19th at the Prophet Elias Monastery. Locals and visitors gather at the Monastery to celebrate the name day of the prophet, in large common diners which resemble the ancient dining, offering traditional chickpea soup, mastelo meat with spaghetti and wine, followed by island music performed by violin and lute. Reaching the monastery involves a challenging hike from Firogia uphill for approximately 1,5 hours as the cars cannot access the monastery, but the experience is definitely worth it as it lasts until the early morning hours so the visitors can enjoy panoramic views at sunrise and explore the hidden Catacombs within the monastery premises. Agios Panteleimon & Agios Polycarpos : are celebrated on July 26th in Cheronissos. Panagia (Virgin Mary): is the biggest in the Christian calendar and is celebrated on August 14th in various churches around Sifnos. Ai Yiannis : is held at August 29th at Faros. Agios Symeon: is celebrated on August 31 at the Agios Symeon monastery that offers panoramic views of the entire bay of Kamares. Taxiarchis: is held on September 5th in Vathi. Agios Sozontos: is celebrated on September 8th at Agios Sostis. Genethlion tis Theotokou (the birthday of the Holy Mother): takes place on September 7th at the Holy Monastery of Vrysis. Timios Stavros (the Holy Cross): is held on September 13th at Stavros church in Faros as well as Honi. Agios Nikitas: is celebrated on September 15th at Seladi. Cycladic Gastronomy Festival Nikolaos Tselementes: is an annual gastronomic festival with international recognition. It is held every year the second weekend of September in Artemonas. 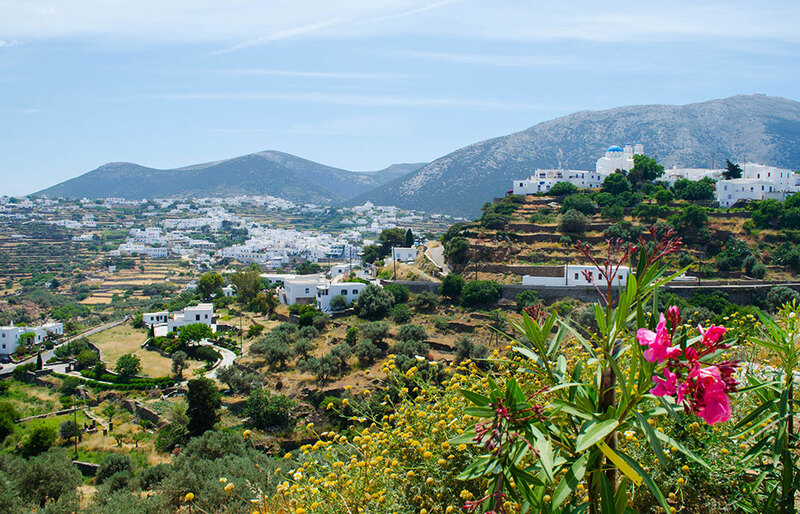 Local people and organizations from the islands of the Cyclades gather in Sifnos to share the cultural and culinary traditions of their hometown. Guests sample the local recipes and enjoy themselves with traditional music and dances.